Home Health Americans are eating way more fat. But it’s not butter. The main finding is no surprise at all: Americans are eating more of all of the major food groups, too many fats, sugars, and grains, and too few fruits and vegetables. But things get interesting when you start looking at changes in certain fruits and vegetables and our shifting nutrient consumption — which involves a lot more added fat. It turns out the avocado supply has surged by 1,342 percent since 1970, while lime availability is up by 1,654 percent. In case you hadn’t noticed, Americans are loco for guacamole and chips, and margaritas. Another surprise: Mango consumption has exploded by about 3,200 percent, while grapefruit, oranges, peaches, and plums are less in favor than they used to be. Apples, melons, and bananas are the top three most available fruits, as they were in 1970. As for vegetables, Americans ate way more broccoli and mushrooms in 2014 compared to the 1970s: The availability went up by 1,146 percent and 937 percent respectively — the most dramatic changes in the vegetable category. (In case you were wondering, kale wasn’t tracked in this report.) And by pounds per capita, potatoes, tomatoes, onions, and lettuce are still favorites. Some things change, and some things stay the same. Beyond fruits and veggies, Americans today eat more chicken and less beef, way more yogurt and less milk. Breaking these foods out by nutrients, though, tells an even more intriguing story. Right now, there’s a lot of discussion among health experts about sugar in the American diet. The anti-sugar camp often suggests that, during the low-fat craze, we replaced fat with sugar in our diets — and our waistlines and health have suffered since. But the report from the US Department of Agriculture finds Americans are consuming more added fats and oils — while sugar consumption has been on the decline. 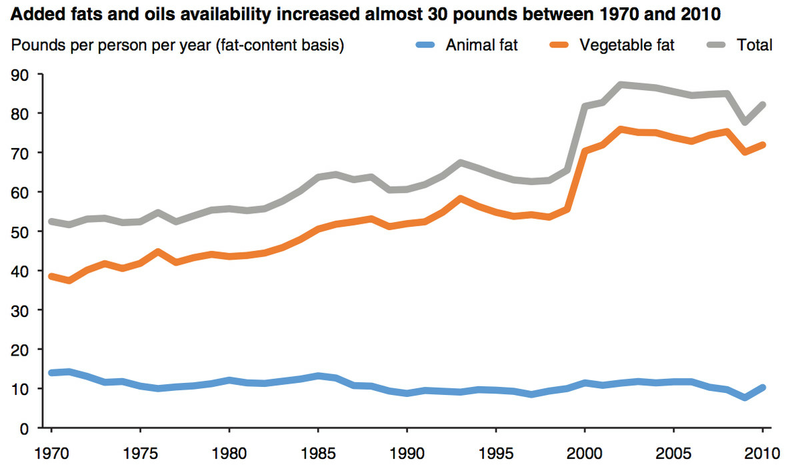 This chart from the report, which tracked changes in US food consumption patterns over the past 40 years, shows the per capita availability of added fats and oils trending upward since the 1970s (though the large jump in 2000 is partially explained by a change in how the data were reported — the number of firms reporting vegetable oil production increased that year). Total fat consumption has been increasing since the late 1990s. Meanwhile, animal fats like butter and lard are down by 27 percent. In particular, butter availability dropped by 8 percent and lard by a whopping 65 percent. So we’ve followed the dietary advice to swap saturated fats with unsaturated fats, but we’re still getting a lot of calories from fat — and fat is the most calorie-dense nutrient of them all. At the same time, the per capita availability of added sugars and sweeteners grew only 10 percent between 1970 and 2014 — a fraction of the rise in added fat consumption. 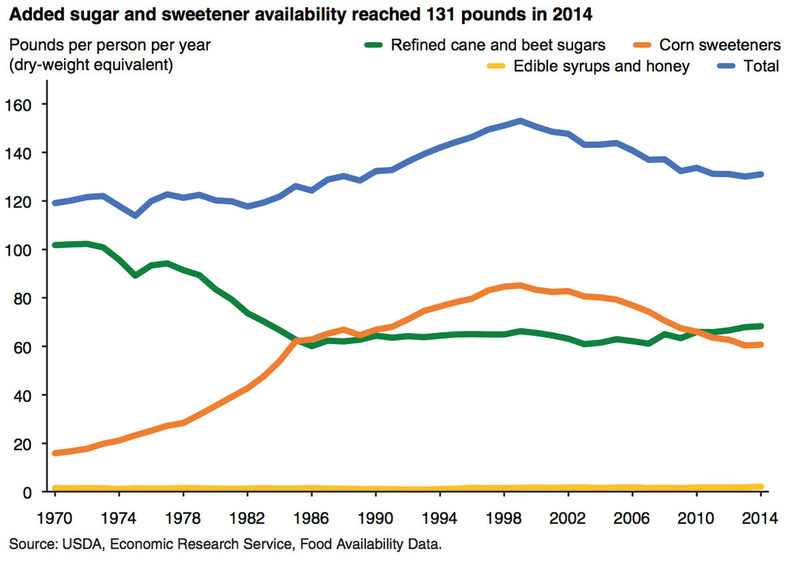 Our sugar consumption is down from a peak in the late 1990s. Americans still consume way too much added sugar — and it’s interesting to note that corn sweeteners are going down, while refined cane and beet sugars are going up. To put all the nutrients in perspective, check out this chart. 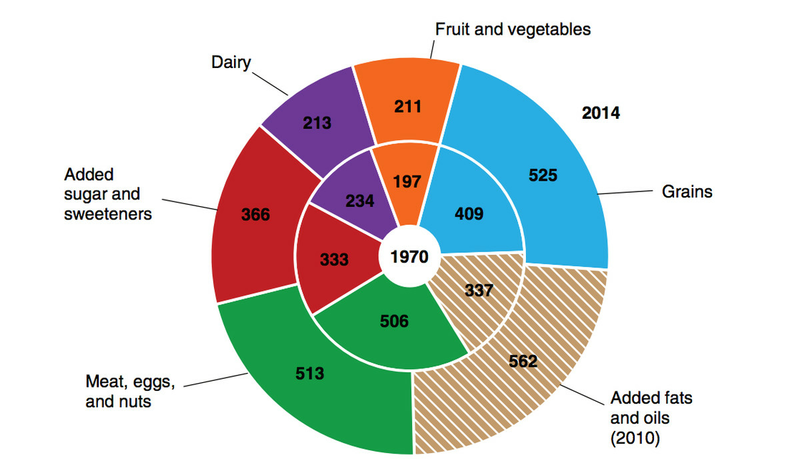 Calories by food group, 1970 (inner ring) and 2014 (outer ring). While the specific foods in certain food groups are changing, we’re simply eating more of everything. And in this same time period, the obesity rate has tripled. h/t Marion Nestle for pointing out the report. Previous articleAmerica’s doctors can beat the opioid epidemic. Here’s how to get them on board. Next articleCalifornia’s huge energy decision: link its grid to its neighbors, or stay autonomous?